We all have that person on our Christmas List who is damn near impossible to buy for. If that person enjoys whiskey, art and history Noah Rothbaum has put together the perfect coffee table book for them. The Art of American Whiskey takes a stroll down memory lane using the visual elements of American Whiskey bottle labels from the late 1800’s until today. It is a very cool book with stories about the growth and development of the booze industry in America and as Bourbon and American Whiskey in general continues to increase in popularity, it is a wonderful way to read about our favorite brown beverage. A bonus of the book is that it also features period recipes for cocktails, some well known to all of us today, others long lost and worth of trying out at your seasonal Christmas parties. The book is listed for $15.89 on Amazon.com right now, so for the whiskey lover in your life, give them something to enjoy along with a bottle of their favorite drink this year. Those of you who are regular followers of this blog know the struggle I have with the seemingly never ending battle against America’s farmers. The lazy mass media wants to blame Monsanto, corn and USDA subsidies for America’s obesity epidemic. Massive corporations such as Chipotle regularly abuse family farmers in their advertisements in an effort to increase their profits. 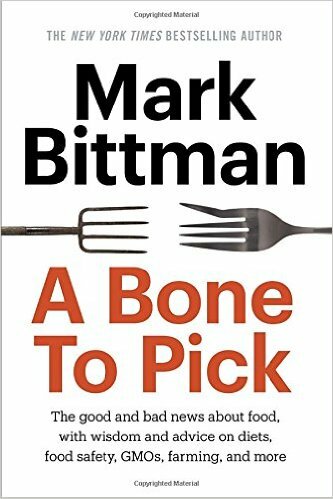 So it was with trepidation and an expectation of hate that I picked up Mark Bittman’s collection of columns, A Bone to Pick, The good and bad news about food, with wisdom and advice on diets, food safety, GMO’s, farming and more. Bittman writes a regular op-ed feature for the NY Times on food. The first few columns I read in the book only reinforced the stereotypes I had in my mind of a downstate NY’er and his absurd naivety of food and farming. The further I read into the book the more impressed I became with his depth of knowledge and his willingness to go to the source to find the facts about food production in America. Unfortunately he continues to demonize American farmers throughout the book, and the continual naive harping and beating up of said farmer gets especially old. Bittman floats some interesting ideas out there, even ones that I can get on board with, Turning your lawn into a garden space that grows your own food is something I’ve dabbled with a little this spring with our edible front garden. There are a ton of skills that my parents generation had when it comes to food and food perpetration that have been lost. I hope to be able to pass them along to my daughter so she has a greater appreciation of where food comes from. So often in this 15 second sound bite world, we argue with half truths and partial theories. What impresses me about the book is that Bittman takes the time to lay out his theories and to examine them. We don’t agree on a lot of things, but I walked away with a new appreciation for his opinions, and a more open mind when it comes to the issues facing America in food. The ability in this 140 character talking point world to do that is becoming more and more rare. Despite disagreeing on how we got here, who is to blame and what the total solution is, the fact remains that America is fatter, unhealthier and less active than at any point in its history. Bittman lays out a compelling case for simple changes that can be made. It is a semi-rational take on food in America and I’m happy I picked it up to read it. If you;d like a copy of the book. Enter the contest below and maybe you’ll be our winner.